Day 5 of my November trip can be described in one way: WET. The morning started with a tornado warning which scrubbed my morning plans of Big Thunder Mountain Railroad and other Fastpass+. So, those got rolled into the evening but then round 3 of the rain came at night and those plans got scrubbed altogether. The Walt Disney World Resort received over six inches of rain on this day in three distinct waves (morning, afternoon, and evening). The only reservations were really kept were our dining reservations. My daughter had a breakfast at 1900 Park Fare with her grandparents while my wife and I had a lunch reservation at Be Our Guest. This quickly turned into the highlight of a very soggy day. Reports are coming in about a stand-by queue change for lunch service at Be Our Guest. 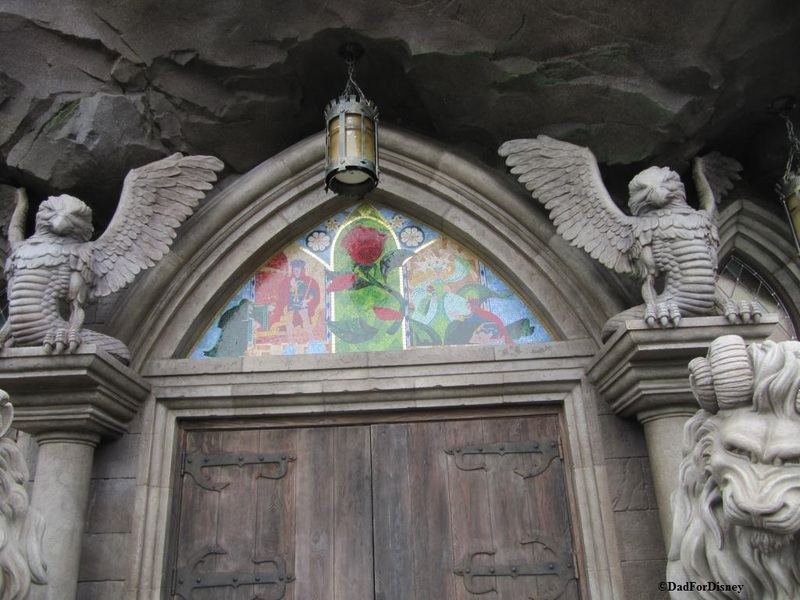 In the past, a queue formed to gain access to the lunch service if a guest was not selected for a Fastpass+ reservation. Now, guests will be given a paper ticket with a return time much like a legacy Fastpass. Once all the tickets have the handed out , the restaurant will be considered closed for lunch, for the day, unless you have a Fastpass+ reservation. It has not been reported if this is a permanent change, a change for a brief period of time, or a short test. Disney tested the paper system with the Anna and Elsa meet and greet in Magic Kingdom and at Soarin’ in EPCOT. This announcement, if it is a permanent change, continues the return of the legacy Fastpass system for Disney Parks. Keep in mind the “test period” for the paper ticket system at the Anna and Elsa meet and greet was only supposed to last three days and they are still handing out paper tickets over two weeks after the end of the test. Be Our Guest Fastpass+ reservations are available only to guests who are staying at a Disney property. Off-property guests will have to arrive to the park early to ensure the obtain one of the paper return tickets to have lunch at Be Our Guest. It will be interesting to watch this change unfold since it has not been reported if cast members are checking if a guest already has a Fastpass+ reservation when they obtain a paper return ticket. If they are not, this reported change could only encourage double dipping on access into the Be Our Guest Lunch. While this looks like a good idea in theory, this double dipping could become an untended consequence of this new queue management. Stay tuned. Last week, I went over the Top 5 Counter Service Restaurants at Walt Disney World. This week, I’m going to tackle the Top 5 Table Service Restaurants at Walt Disney World. However, I’m making one qualifier to this list. Signature dining experiences are not eligible for this lists because they would dominate the list crowding out some deserving restaurants. All of the restaurants, on today’s list, cost only one table service credit per person (if you are on the Disney Dining Plan). As with all lists, it’s opinion-based and this list reflects that. It’s based on restaurants that I have eaten at in my many visits to Walt Disney World. Your list may be different because I know I haven’t eaten at every restaurant so I know I’ve missed some places. Now, let’s eat! This article is going through my top five counter service restaurants at Walt Disney World. There are counter service restaurants everywhere in the World making it impossible to eat at all of them in any one trip or even two or three trips. This adds to the variety of a guest’s vacation. These restaurants serve a wide variety of cuisine making it easy, for even the picky eater, to find something to find something to eat. And with that introduction, I bring you my top five counter service restaurants at Walt Disney World.